Wear the Shirt! Visit the Lab wot dun it!! NEWS: Wear the Shirt! Visit the Lab wot dun it!! Avery Dennison was recently named the global licensee of F.C. Barcelona's name and numbers shirt customization according to an article in Printed Electronics Now. Avery Dennison products include names, numbers, crests, woven labels and specialty trims. The company is already a provider for a number of the top clubs in La Liga and 90% of clubs in the English Premier League. 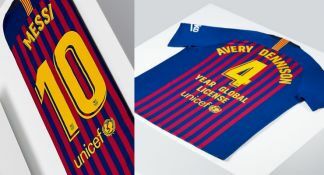 Nikita Jayasuriya, global director, head of team sports at Avery Dennison, explained about the heat transfers and RFID technology used in the La Liga squad’s jerseys. “Radio frequency identification (RFID) is currently being used for stock management of the supply of the names and numbers to ensure the FCB shops are fully stocked with our heat transfers. The RFID technology we use to package and track our embellishments is a game changer in the sports supply industry and can help increase retailers’ revenue. “The time from which products are supplied from our factories to a store for purchase is reduced dramatically and retailers have visibility of when the product will arrive, so fans can have the number of a new player on their shirt or jersey within hours of a new player signing,” she said. Driven by technology, the I.Lab is a state-of-the-art RFID experience centre in Oegstgeest, Netherlands, that showcases Avery Dennison’s capabilities in RFID / NFC (passive & active) and intelligent labelling, offering hands-on experiences, live demonstrations, and customer case studies. The centre’s interactive displays exhibit Avery Dennison’s work to transform multiple industries, from retail and apparel to food, with goals to expand intelligent labelling solutions to other areas such as cosmetics, automotive, pharmaceuticals and aviation. “Our vision for team sports is that each garment is designed with a unique digital identity that allows fans and customers to connect to the physical product via their mobile device. The experience they receive is controlled by an intelligent rules engine, based on their location and preferences. This means fans can use the jersey for several benefits in the form of game-day experiences, product authentication, fan registration and tiered loyalty programs.